« Our Holiday Specials are Back! A Super Sunday Fiesta at Casa de Bandini! Plans for the Super Bowl? 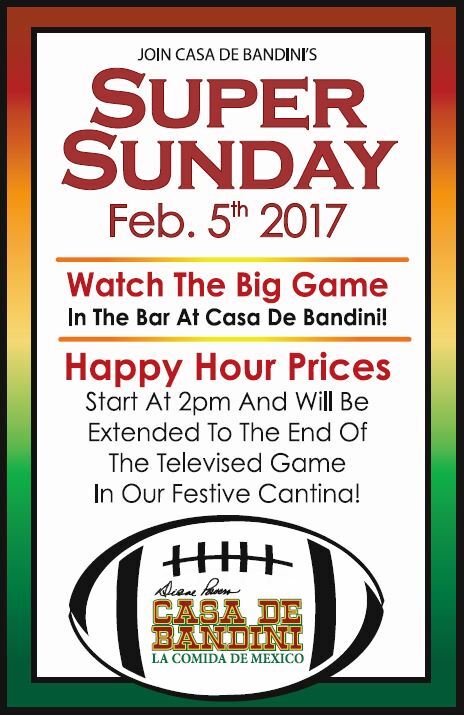 Come join the fiesta at Casa de Bandini in The Forum Carlsbad! This entry was posted by The Bandini on January 26, 2017 at 1:13 pm, and is filed under Blog Entries, Special Events. Follow any responses to this post through RSS 2.0. You can leave a response or trackback from your own site.